If ever a region had a built-in set of trademarks, it’s the Adirondacks. From the iconic Adirondack chair to the utilitarian guide boats to the rustic birch-bark and twig furniture, New York’s North Country is rife with regional emblems. One perennial at gift shops and home-goods stores throughout the 6-million-acre Adirondack Park is the pack basket. To tourists, these may seem like your average decorative baskets. They’re anything but, though the miniature iterations do look charming with flowers sprouting from the top. 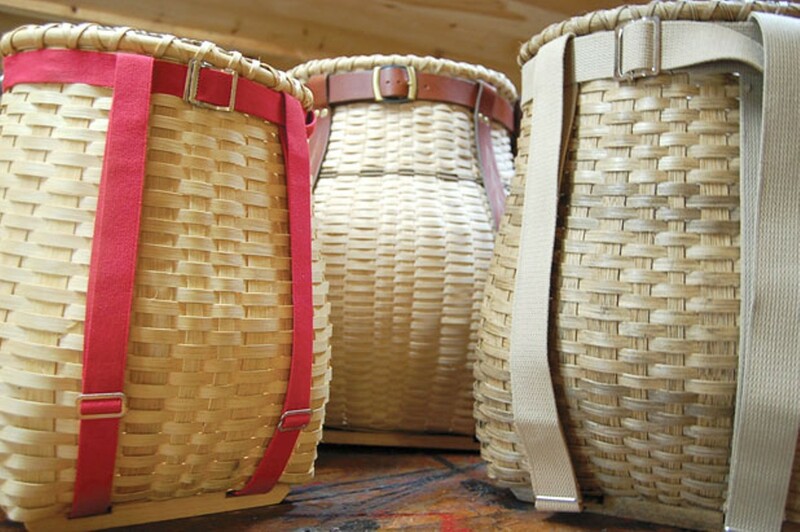 Pack baskets are woven baskets that are worn like rucksacks, and they are as much a part of the Adirondack narrative as the trappers and fishermen who used them. As long as there have been people in the Adirondacks, there have been pack baskets. But, before you can understand how the baskets became one of the unofficial symbols of the North County, you need to understand just what they are. Black ash, native to the northeast and especially to swampy areas, has long been the wood of choice for pack baskets because of its extreme pliability, suppleness and strength — it doesn’t splinter. In traditional pack-basket making, the ash was cut, then pounded until the growth layers separated into strips. Today, some basket makers use reed from China for the strips — the vertical thongs also called splints — and the weavers, which run horizontally. The reed is not as strong as black ash, but it’s a quarter of the price, and sources for the northern wood are limited. Many Adirondack weavers who do use ash go outside the state to find splints, although there are still traditional basket makers who cut their own trees and pound out the splints themselves. Jack Leadley and Bill Smith — North Country legends and well north of age 70 — both procure their own black ash. The wooden splints are woven to create a flat bottom so the basket can stand upright, which was handy for canoe travel. The baskets have a bowed belly and a narrow mouth and can typically carry 50 to 60 pounds without cracking, depending on their size. Leather or cotton harnesses hold them on the wearer’s shoulders. While pack baskets don’t look comfortable, they are actually surprisingly light and pleasant to wear. Historians believe they evolved from the carrying baskets of the Algonquian people who populated the region, says Hallie Bond, curator at the Adirondack Museum, which boasts 35 antique baskets in its collection. She notes that they were useful for carrying supplies, and even babies, through the woods. As white settlers moved into the region, they adopted the baskets as their preferred carrier, largely because they were so functional; water didn’t rot them, and heavy loads didn’t crush them. The Algonquians and Iroquois people, who also crafted pack baskets, earned a tidy profit selling their woven wares to French trappers and traders. Over the years, the pack baskets became de rigueur for white hunters and trappers, says Bond. Adirondack guides began making them, and today, many park residents still prefer pack baskets to modern backpacks, says Jill Breit, executive director of Traditional Arts in Upstate New York. Like most pieces of outdoor equipment, the utilitarian pack baskets are not without their hassles. With only one way into and out of the pack, finding things can be a pain. In the North Country, there’s a joke that whatever you need is bound to be at the bottom of the basket. 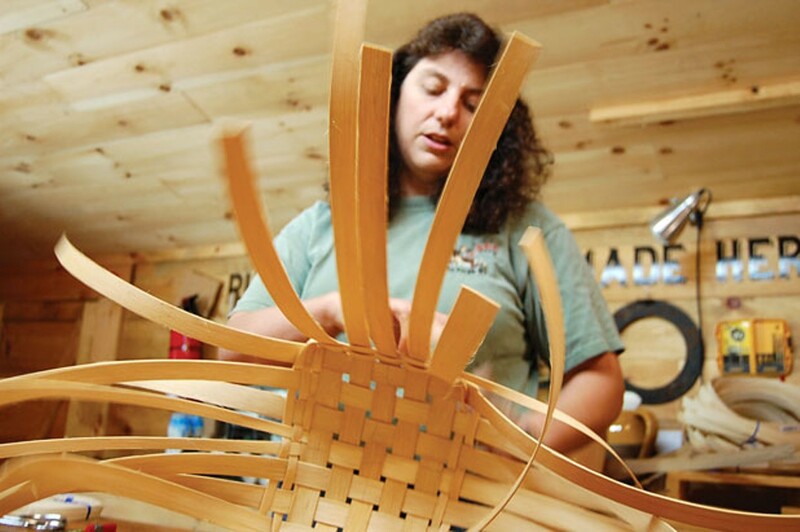 Ann MacBride, a weaver from Wilmington in the Lake Placid region of the park, first learned to make pack baskets 10 years ago, when she resided in Rochester. Her now-husband was living in the Adirondacks, and, during a visit, MacBride enrolled in a pack-basket-making class at the Adirondack Loj. When she was laid off from her job at Kodak, not long after, MacBride used her reeducation money to further her studies in the Finger Lakes region with renowned basket maker John McGuire. She also apprenticed with Leadley, who lives in Speculator. MacBride, 44, is a tall, sturdy woman with a crafter’s rugged hands. When she’s not making baskets, she mans the switchboards as a dispatcher for the Department of Environmental Conservation, volunteers for her local fire department as an EMT, and serves as a wilderness first responder for Search and Rescue of the Northern Adirondacks. MacBride isn’t sentimental about her basket making. She’s not necessarily doing it to preserve a regional craft, but because she loves baskets and finds crafting them therapeutic. Her appreciation for baskets extends beyond her own weaving. 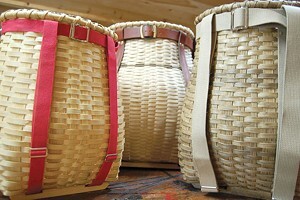 She collects pack baskets made by old-timers like Leadley and Smith, who are considered the masters of this craft. Recently, I visited MacBride at Dartbrook Rustic Goods, an Adirondack-style-furniture dealer in Keene, N.Y., where she sells her pack baskets. In the rear of the distinctly luxe store is a small workshop that MacBride has been using while her own home is being renovated. In a bucket at her feet, splints soak in water to make them pliable enough to work with. “Moisture is black ash’s friend,” MacBride says. Once the splints are sufficiently waterlogged, she can begin weaving. Each splint has been cut 40 inches long, giving her enough material to make a basket 14 inches high. Over and under, over and under, MacBride threads the wooden strips. Though she’s been making baskets for only a decade, she works with an ease that makes this seem old hat. Once she has woven the rectangular base with the splints, she begins to insert the weavers, which run horizontally through the basket. Thinner than the splints, they do not need to be cut to a specific length. When one weaver ends, MacBride tucks it under a splint and starts lacing in another over the top. Periodically, MacBride pushes the weavers down to create a tight form. “It rips apart my nails and cuticles,” she says. But that part is essential. When the basket dries, the wood shrinks, so tamping down the weavers prevents gaps. Soon a basket begins to appear, with its back flat and its belly bending outward. MacBride doesn’t shape the baskets on a form; she knows from practice how to weave the wood to get that distinctive pack-basket silhouette. After the basket is woven, it sits out to dry for at least 24 hours. Then the rim, handle harness and wooden runners on which the basket sits must be attached. Depending on the size, each pack basket takes about four to five hours to make, MacBride says. And they aren’t cheap to buy. One of MacBride’s large packs, which will hold a multiperson picnic, a day’s haul at the trout stream and then some, sells for $395 at Dartbrook Rustic Goods. That’s a lot of money for containers MacBride says she’s used to take laundry to the cleaners. But with minimal maintenance, pack baskets can last for decades — longer than most modern rucksacks. Plus, they’re as pregnant with Adirondack mystique as the woods themselves. Buyers know they’re not just bringing home another decorative basket — they’re investing in a piece of history. The original print version of this article was headlined "Carrying On"